Since 2000 the Colorado Quartet has been Quartet-in-Residence at Bard College, where it gives frequent performances in addition to its touring schedule. The Quartet is also a regular ensemble at the Mostly Mozart Festival. It has often performed complete cycles of the Beethoven Quartets, including one in Berlin in the Fall of 2001. Although I’m very fond of the Emerson String Quartet’s traversal of the complete Beethoven quartets, I admit that there are some performances of the middle and late quartets that eclipse theirs. My favorite versions of the middle quartets are those by the Tokyo Quartet (RCA), while in the late quartets I am equally enamored of the performances by the legendary 1961 Yale Quartet (originally Vanguard) and the digital recordings by the Vermeer Quartet (Teldec, 1988, possibly the most underrated set of the quartets ever marketed). Therefore, in the late quartets especially, the Colorado has some very formidable competition indeed. Moreover, I was somewhat put off even before listening by the surprisingly low-budget production given this set. Parnassus Records and Leslie Gerber have long stood for quality in my mind, but the Word-document-produced box cover art and the thin paper of the booklet, with poorly reproduced photos of the artists, did not inspire confidence. Moreover, the front and back cover art is printed back-to-back on identical cheap pieces of paper: just pop open one of the jewel box backs and see for yourself. But, as they say, the cover does not always make the book. If it did, James Joyce’s Ulysses wouldn’t have sold 15 copies. The Colorado String Quartet tears into these works with a combined tension, cohesion, grace, and complete understanding of the music that I haven’t heard since the Yale Quartet. All written repeats are observed, which may or may not thrill the completist, but Colorado refuses to let them sound “the same” when these passages are repeated. No, indeed. On the repeats, there are slightly different colors, accents, and shades of color. They are not only master architects, but master painters. Their palette of sound has a hidden layer of hues that no one else has discovered or used. his publisher’s demands to the more audience-friendly finale published as part of the quartet; but the Colorado also gives this much cheerier (and simpler) movement life and drive. By the time you’ve recovered from op. 130/133, it’s time to discover that, in their hands, op. 127 is no less intense, despite its slightly more cheerful cast. The Colorado’s gradations of tone and volume are part of that color palette I mentioned earlier, and they pull out all the stops in the very first movement of op. 127. The Adagio is played with such deep, almost inexpressible sadness that I found it impossible to go on to the third movement when it was finished. I discovered, much to my surprise, that I was in tears, despite the cheery middle section. The sprightly Scherzo is taken with the coiled springiness of a cat in mid-leap, the finale with elegance as well as optimism. Because of timing considerations, I’ve always found it interesting that op. 127 is nearly always followed by op. 131, the post-Grosse Fugue quartet. The effect, as always, is akin to leaving a party and taking a step into a dark, empty elevator shaft. The mood and colors of the first movement are varied but all of a darkish hue; there is no light here. C# Minor is an uncomfortable key, and Beethoven exploits this discomfort with music that passes through major keys yet knows it does not belong there. By this point, Beethoven knows his place in the world. He is a stranger among men. He tries to fit in, but simply can’t. This is music of incredible isolation—not necessarily loneliness, because he is comfortable in his little cocoon, but isolation nonetheless. He has walled off the world with his mind and soul. The remainder of the quartet is a prismatic exploration of every facet of his heart and soul. There is still joy there, an almost bumptious humor; he still loves life; but he’s no longer a part of society. They have not passed him by—he has passed them by. For me, Beethoven’s last two quartets, like his last two sonatas, are like the closing of a door on life. You’d better be in a good mood when you listen to this music; unlike the sonatas, which float ethereally up to heaven, the quartets are incredibly sad. They are his equivalent of Mahler’s Ninth and 10th Symphonies. He’s still trying to smile, but it’s a dark night of the soul. The cheer seems forced, almost artificial; he knows the end is near, and he’s still not quite sure how he’s going to handle it. Colorado’s performances, here, are exactly on the knife-edge, the complex and sometimes mixed emotions perfectly intertwined with the notes and phrases Beethoven wrote. I give you fair warning. If you are sensitive by nature, don’t listen to this complete set in one sitting. Take it one, or two, quartets at a time. I was rather surprised to find the op. 95 quartet here, rather than with the middle quartets where it belongs. (G’wan, you, scram, get out of this playground!) They give a rousing version, however, and by placing it here they were able to fit the other middle quartets on two CDs, compared to Tokyo’s three (Parnassus 96034). Michael Fine, in Fanfare 27:3, enjoyed this set of the middle quartets but found them somewhat inferior in “symphonic weight and line.” I can’t argue with that for two reasons: of the middle group, I can only judge op. 95, which is not really in the same style as the “Razumovsky” quartets, and it is true that although they have a good tone, sheen of sound is not what the Colorado is all about, but rather a penetrating insight to the emotional content of the scores. The sound of the Colorado’s instruments, particularly in the dry recording space of the Sosnoff Theater at the Fisher Center of the Performing Arts in New York State, is leaner, less lush tha that of the Vermeer’s. If tonal opulence is a particular requisite of yours, Vermeer’s is still the preferred set; no quartet has ever combined intensity with richness of sound quite like they did. But if it’s the music and what the music says that interests you, well, this is the only set of the late quartets you’ll ever need. Buy it, and marvel. These four women bring Beethoven to intense, blazing life. 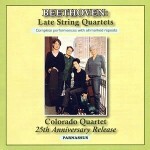 These recordings were made in 2004, 5 and 6 and issued in 2008 to commemorate the Colorado Quartet’s 25th anniversary. The release was produced and engineered by Judith Sherman in the Fisher Center for the Performing Arts at Bard College in Annandale-on-the-Hudson, NY. The inclusion of Quartet 11, Op. 95 rounds out the group’s readings of Beethoven’s middle-period quartets, which Elaine Fine saluted for the players’ unity of sound and clarity of their interpretations (July/Aug 2003). Beethoven’s late quartets are a tall order for any group, and in its first crack at them on records the Colorado succeeds admirably. That especially applies to 13, 15, and 16, which are appealing in the players’ rich blending of sonority, the energy of their phrasing, and their unerring sense of purpose. No. 15, for example, seems to ooze magically out of the composer’s own ethos; and what follows has just the right amount of tension and release. The third movement prayer of Thanksgiving, ‘Heiliger Dankesang,’ is done with restrained vibrato and an almost early-music purity, and as a result benefits from an appropriate supplication; and in V the group fully captures Beethoven’s almost Whitmanesque song to himself. Elsewhere a little nit-picking is in order over some brisk tempos in 12 and 14 (stemming from the group’s otherwise commendable tendency not to dawdle). The Grosse Fuge, programmed here as the final movement of 13, comes up short of the necessary bravura muscle. Otherwise 15 is a total triumph – which leads me to some thoughts on the subject. Having listened to the late quartets all my adult life, and having reviewed four sets of them in less than a year for ARG, I have concluded – and this is of course just one man’s meat, to use the phrase EB White immortalized with his book of the same name – that Beethoven and his publisher Matthias Aretaria [sic], were right. The Grosse Fuge does not belong in 13. The full quartet begins with a wonderful serenity and in V, the celestial Cavatina, the composer raises that serenity to cathedralesque heights. Beethoven’s second final movement, a 9-minute allegro written to replace the fugue, energizes that serenity but maintains it. By comparison the fugue is an earthquake of contrast. To put it mildly, it makes the work lopsided. Removing it from consideration of the Colorado’s 13, one is left with nothing to complain about – far from it. II for example, is virtuoso stuff in its presto sleight-of-hand, and in the dance-like III it is such a pleasure to hear the music given this much expressiveness. The Cavatina is made a short sermon about most everything Beethoven believed in at the end of his life. Of late it has been the habit of quartets and their producers to go back to Beethoven’s very first idea. That is, they have placed the fugue right after the Cavatina. This was the approach taken in the fine 1990-91 RCA set by the Tokyo Quartet and most recently in the exciting new album by the Orion Quartet (Sep/Oct 2008). To me that no longer seems to work. Publish the Grosse Fuge separately, as in days gone by was done by the Quartetto Italiano and the old Budapest Quartet. Tastes vary, of course, and music lovers who still want to choose their own ending should certainly be given the opportunity, as they are in this release. But here is a vote for placing the allegro first.